A beautiful pair of feathered wings grace this equine. 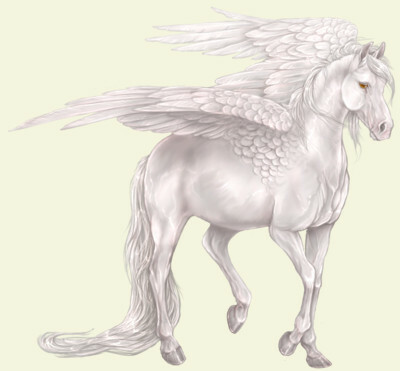 With a pure white coat, pegasi are nearly invisible when flying in clouds, making them ideal for journeys of secret natures. Capable of long flights, even with a rider, this pegasus makes a powerful steed, and journeying to high up mountain tops in search of exotic eggs is much faster without a long trek on foot. Pegasi live in close proximity to unicorns in the Silva Forest, forced to hide from those who would harm them. Wary by nature and extremely agile, a magi can only be graced with one of their offspring if they are deemed worthy, honorable and kind. On a clear day, you can sometimes crane your neck and see a white sparkle in the sky. Sometimes a winged horse can be spotted, threading its way through clouds, occasionally with a magi on its back. Villagers regard such sightings as lucky, and have many myths about these beautiful creatures. Fully grown, pegasi make excellent choices as companions on journeys, able to take to the sky at any sign of danger, and traveling almost as fast on foot as in wing. At The Keep, unicorns and pegasi keep close together, their bonds of friendship deep.